October 16 will not be a day not soon forgotten if you live in Western South Dakota. Ninety degrees in the northern plains is not normal for that time of year. Add to that winds of 40 steady with gusts over that by plenty and you know what could happen with a lot of dry grass standing. It was a normal start, church in the morning, lunch and then a few odd chores. First thing after getting home from church was move a vehicle. Being the nice Dad I am I let my daughter drive us home in our side by side. Uphill I looked at the sky and saw it, SMOKE. Too close to change spots, my reaction was "that is smoke, hit the throttle!" I told her to get in the house and left like my back pockets were on fire. I could tell it was far enough south that my place was going to be in the clear, but it was also abundantly clear that it was going to take a massive effort to put it out. Shortly before, 911 had been called. Flames had been spotted right along I-90. Latest reports are they will never know the cause but they do know it was man-made. A passing fire fighter from another area made the call. At that time it was the size of a pickup box but he was without anything of use to put it out. He put up a valiant try but it got over the fence. Philip Volunteer Fire rolled out at 1:15 pm. By then it was gaining a head of steam and was rolling through a pasture that was only grazed in the winter so fuel was plenty and the wind worked quickly. It was 30 miles travel for the firefighters. To keep the timeline straight I probably saw the smoke about the time the firefighters got to the scene. Everyone who is out here has a pickup mounted firefighting unit/weed sprayer, but nearly all had been drained and winterized. The wind was going to push the fire into a very large field of wheat that had been combined months before, a massive fuel source. With nowhere near enough manpower but a grim determination the few firefighters that were able to get there quickly enough fought with everything they had to keep it out of the combined field. Alas, their best efforts could not, and then they fought for their lives to outrun the fire in their trucks. One thousand acres burned in three minutes. In 10 minutes the fire was three miles from where they desperately fought to keep it manageable. Dust trails roll out on every gravel and dirt road for 50 miles. A pickup, the man behind the wheel has his heart in his throat and jaw set. Desperately hoping somehow a miracle happens and it gets controlled before he gets there, but if not, I CAN DO SOMETHING!!! What was next was pure chaos. Not once in my life have I thought that this could happen with the equipment we have today. Fences were cut, cattle shoved out of what we thought "in the way" was. Just as soon as we thought we knew what the direction was, the wind hit the back of my neck just as hard as earlier. My only thought was, "run!" Not for me but the families that lived in the new direction. Helpless is a feeling that most have had. I thought I knew the feeling, could understand it. Standing on a hill southeast of Cottonwood I realized that I had never felt it before. The fire that had charred a path 10 miles long in two hours was now 10 miles wide with the wind howling. At least six ranch headquarters lay directly in its path. Dust is still rolling, not just behind pickup trucks but behind fire departments arriving from every corner of the western half of the state. Nearly 300 firefighters, almost all volunteers, from 40 different departments spanning 10 counties battled the beast. Add on what had to be 500 other helpers. As brutal as Mother Nature can be, change always comes. With the sinking of the sun the winds slowed and the manpower was able to get the upper hand. The terrain was level enough to fight it effectively. Eventually it was unable to consume more and had to be satisfied with burning what it had already started. The heroics of that day were more than can count. Firetrucks smashing through fences just yards in front of flames to save cattle. A young girl who had never driven before helping get vehicles to safety. Some young or old could only pray while some gave their eyebrows. Yet in an incredible miracle of everyone working together and keeping their cool each of the primary residences were saved. Almost more amazing was there were no major human injuries. But 41,360 acres lay charred in the wake. Thousands of bales up in flames along with most winter grass, somewhere over 200 miles of fence, barns and other outbuildings along with what stands right now at 284 head of cattle. All of us on the drive home thought that there had to be some way we could have done more! And now, after all is burned, if only we could crawl in a hole and wish it had never happened. The possibility of any of us making one iota of difference in the cleanup/get back to whatever the new normal is going to be seemed farther away than the moon. There needs to be a term over shellshocked to describe what happened in seven hours of Hell on earth. That is right, depending on who you believe on when the fire line was contained it burned from 120-135 acres a MINUTE from pickup box size till contained! To paraphrase the song "through the dust and smoke of this man made hell walked a man with a giant idea that nobody knew well." Still reeling from this I got call from Bob Stanfiel. He is a competition BBQ cook that I had met on four occasions. I get to the house at 12:30 a few days after the fire and he has left a message on my phone. "Don't know what I can do to help but I can cook." On that day Bob could have walked the streets of Philip unknown. He had catered an event for me but not 15 people in the town would have known they recognized him. 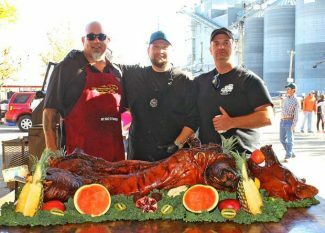 Bob called a few of his competition BBQ buddies to hold a fundraiser for fire relief. Free food donated from out of the area cooked to perfection with a free will offering. Philip, South Dakota is a town of 800 people. A sports team is playing out of town, some have to work, hunting season is upon us so everyone with an guest is gone. They pull in to town with 1,000 pounds of BBQ meat and start cooking. Mother Nature gave us a perfect day. As if the firefighters had not done enough they pulled their trucks out of the shop, scrubbed the floor and set up tables. A couple guys drive close to 100 miles to pick on their guitars and sing. There is NO WAY a town like this can eat 1,000 pounds of meat even counting outsiders with all this going on. Eleven o'clock am was the advertised start time. By 11:05 there was a line. At a rate of 300+ people an hour going through, the line at 12:30 it was a full block long. About 2 p.m. that line got to where the wait was only a few minutes. $42,000 that would be no problem anywhere, right? Free will donation? Six competition BBQ cooks prepared the food for everybody that came. 1,000+ people were served. I tried to catch the guys who were affected and make sure they didn't pay. One of them replied "others got it worse than I did" while he dropped $100 in the bucket. $100 to the guy with him and left. Couldn't hear or walk but wanted to help. 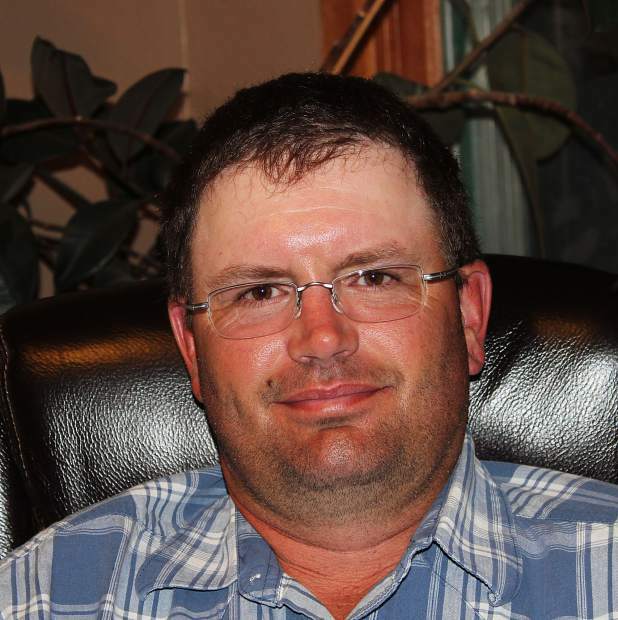 A cattle buyer from Missouri showed up at 5 p.m.. Sorry, the food is gone. He made a donation anyway. I am sure that wherever a person goes it would be the same level of care for their fellow man, right? It would be no problem anywhere to get 800 men to stand shoulder to shoulder to protect someone else's property, right? Should be easier in the city, right? Since the fire there have been many tons of hay donated and days of labor donated to get fence back up to contain the cows through the winter. And then the fundraiser. Bob had never met a single person affected by the fire when he called me. One of the first guys in line had driven 100 miles to come. He wasn't the farthest away when it was over. And the best thing to happen was the handshakes and conversation going on. 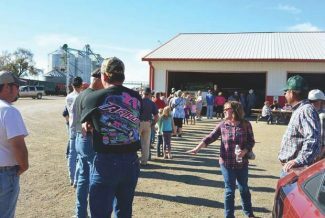 "Haven't seen you in a while" was probably the most used phrase of the day as the community got even closer knit, not just the community of Philip but the community of agriculture over a large area. Friendships were re-enforced and friendships made and the ties that bind gladly accepted another knot. There is a part of the human condition that only survives by giving. It does not live on a large paycheck nor by locking your door and watching TV. You cannot keep it going by not knowing your neighbors or by being suspicious of what somebody else wants of you and always making sure you come out on top. No, if you want it to survive you have to feed it. Know your neighbors, care about their well-being and volunteer for something. It is commonly known as compassion and it's side effect is satisfaction. It seems to flourish in rural America but seems to be endangered in the cities. I may drive through a city but the only way I will stay there is if you drag my dead body there and dig a deep hole. Maybe you should put a large rock on top if you want to keep me there.